This workshop will introduce you to the ethics of permaculture, zones and sectors while demonstrating the effectiveness of using permaculture principles to develop and nurture relationships between people. The presentation will share the experiences of a well-established intentional community and get you up out of your seat and started on making your own new experiences. It will lighten your spirit and inspire you to use permaculture in your social sphere as well as in your garden! Laughter possible, smiles guaranteed. Tracy Matfin is an educator turned farmer, mother and permaculture instructor. 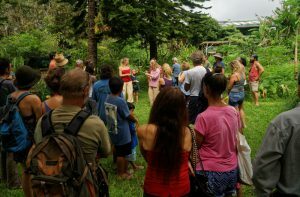 She is a founding member of La’akea Community where she has been living and experimenting with social permaculture & sustainability for over ten years. Tracy grew up in the S.F. bay area, CA. She studied enviromental science at U.C. Berkeley. She enjoys sharing her experiences, sitting with trees, communing with the “weeds” she is removing from the garden and laughing with her daughter, Aia’ala, friends and family.